We’d love your help. Let us know what’s wrong with this preview of The Pint Man by Steve Rushin. A funny and endearing novel about the comforts of a never-ending adolescence and the glories of Guinness. For Rodney Poole, a friendly and unassuming lover of clever wordplay and television sports of all stripes, Boyle's Irish Pub is a haven of good cheer, pleasantly pointless conversation, elaborate jokes, heated trivia contests, well-poured pints, and familiar faces. The A funny and endearing novel about the comforts of a never-ending adolescence and the glories of Guinness. For Rodney Poole, a friendly and unassuming lover of clever wordplay and television sports of all stripes, Boyle's Irish Pub is a haven of good cheer, pleasantly pointless conversation, elaborate jokes, heated trivia contests, well-poured pints, and familiar faces. The pressures and demands of the outside world hold no sway there- the crowd at Boyle's is his family, and with family all sins are forgiven. But reality cannot be kept at bay forever, and now Rodney's best friend and partner in inertia, Keith, is getting married and moving to Chicago. Since Rodney has for the most part enjoyed his bachelorhood vicariously through Keith, the prospect of being single, middle-aged, unemployed, and without his pal to while away the nights with is causing Rodney to rethink--or rather, create--his priorities. To ask other readers questions about The Pint Man, please sign up. The Pint Man is a date movie for guys. Paradoxical as that may seem, that's the best way I can think to describe this novel, which is part frat boy drinking binge, part love story, and all word play. My actual rating for this one is 3.5. The hero of the story, Rodney Poole begins the story adrift: he's recently lost his job, his best friend is engaged and on the brink of moving to Chicago, and he still hasn't found someone with whom to settle down. Unsettled, actually, is perhaps the best way to describe Rodney, as he drifts through the days, spending much of them in his favorite New York bar, Boyle's. But then Rodney has a date with Mairead, and the world begins to shift a bit as he lurches toward adulthood. The bulk of the book, then, follows Rodney as he struggles to develop this new relationship into a commitment at the same time as he watches his best friend, Keith, continue to play the field, despite his engagement. Rodney must also negotiate his career path as a job as a clerical position opens just as he considers following his dream to become a writer. At this point, The Pint Man may sound fairly formulaic to you, and plot-wise, it is. I knew within two chapters where the book was heading and how it would end--it is a classic date movie plot line. But you know, I like that sort of thing. What The Pint Man has that you won't find in your average date movie is a tremendous amount of clever word play. Those who have read Rushin's Sports Illustrated columns or follow him on Twitter know that he is a master at puns and other verbal machinations. Aside from Mairead, who is the star character in a supporting role, the word play is what I liked best. While I was reading The Pint Man, I kept asking myself, "Who is the audience for this book? It is a story about a mid-thirties man-boy who likes beer and sports, paired with a love story (and, even if predictable, it is a good love story) and linguistic gymnastics. Who is this book for?" Well, me. Maybe you, too. Rodney's an unemployed man in his 30's who loves wordplay and grammar, spends all his free time at a local bar called Boyle's, and is interested in a woman his best friend set him up with on a blind date. This book covers probably two weeks of his life, starting when he first meets Mairead (the love interest) and continuing through problems the two of them face, as well as problems Rodney has with his best friend, who's currently crashing at his apartment. I think I would have liked this novel a Rodney's an unemployed man in his 30's who loves wordplay and grammar, spends all his free time at a local bar called Boyle's, and is interested in a woman his best friend set him up with on a blind date. This book covers probably two weeks of his life, starting when he first meets Mairead (the love interest) and continuing through problems the two of them face, as well as problems Rodney has with his best friend, who's currently crashing at his apartment. I think I would have liked this novel a lot more if I were someone who loves drinking beer at dive bars or male. Since I am neither, I think a lot of the book's potential charm was lost on me and instead I simply read it as a coming-of-age novel for a 30-something. There are some amusing exchanges in the book about words and grammar, and the author definitely came up with some fun wordplay. I liked the fact that Rodney's obsessed with words and that he falls for Mairead because she understands and finds him charming because of it. However, that said, there was a lot of filler material in the book that didn't amount to much at the end, such as a subplot about Rodney's best friend and his fiancee. It was also filled with a lot of bar descriptions and talk that, to me, lacked the urgency to keep me glued to the page. The protagonist and author both have a deep love of the English language and all the ways it can be the ultimate playground for those with clever brains. Extremely fun to read. But what's even better, there's a well-thought out, deeply human narrative that lifts the book above mere gimmickry. To label this book "Irish" is a bit of a stretch. Much of the book, as you'd gather from the title, takes place in various pubs Irish in nature. Of sorts. Close enough for me, then. I'd very much like to give this book less than 4 stars. In many ways it's the ramblings of a literary nut. Each page is crafted with the special care of a gifted wordsmith. If you could diagnose a book with ADD, this would be that book. In several ways it drove me bonkers. Still, I can't deny the fact that this book ma To label this book "Irish" is a bit of a stretch. Much of the book, as you'd gather from the title, takes place in various pubs Irish in nature. Of sorts. Close enough for me, then. Still, I can't deny the fact that this book made me snicker, chuckle, and even laugh out loud more than anything I've read in quite some time. Looking back at my books, that's understandable as I'm pretty heavy on the crime/PI/mystery stuff, but I've got a few books in there that are written by 'funny-men' and none of those tickled my funny bone as much as Rushin did with The Pint Man. And to be honest, the story behind all the jaunty banter (is that a double positive?) is also quite good. I enjoyed Steve Rushin's columns in Sports Illustrated, and I'm impressed that he's married to Rebecca Lobo, but I'm not sure he's a great novelist. The book was entertaining enough. My husband enjoyed it more than I did. It's definitely a man's book. But it's a quick and light read. Nothing earth-shattering. It's primarily about beer and dive bars, after all. A Beer soaked romp through several days in the life of a loveable, 30-something, loser. Filled with trvial factoids about sports and booze, a great read for anyone wondering "what do I do now?" or "am I the only loser this is happening to?" Recommended for the academic alcoholic / alcohol aficianado in you (or, anyone who simply enjoys a fun "manly" read rife w/ witty repertoire). Beer, Bros, bars, and New York City. 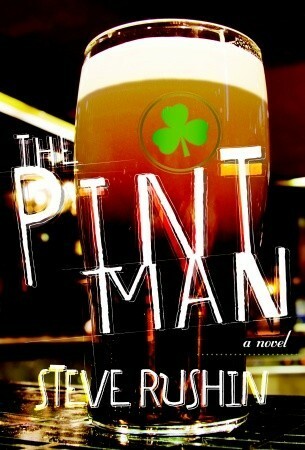 The Pint Man is the first novel by Steve Rushin, a former long-time columnist for Sports Illustrated. For anyone who read his columns, they knew of Steve’s love of wordplay. That love continues in Rushin’s first novel. Like many first time novelists, Rushin writes what he knows, which usually makes the writing semi-autobiographical. Rodney Poole, the book’s protagonist, is clearly based on the author himself, a quiet but quick-witted aspiring writer. Rushin skewers this in fact in one of the best The Pint Man is the first novel by Steve Rushin, a former long-time columnist for Sports Illustrated. For anyone who read his columns, they knew of Steve’s love of wordplay. That love continues in Rushin’s first novel. Like many first time novelists, Rushin writes what he knows, which usually makes the writing semi-autobiographical. Rodney Poole, the book’s protagonist, is clearly based on the author himself, a quiet but quick-witted aspiring writer. Rushin skewers this in fact in one of the best parts of the book when Rodney discusses with Mairead (rhymes with parade), his main love interest, how many of the protagonists in famous novels are aspiring writers. Of course they are, because the authors wrote what they knew. Not unlike when I used to read his SI column, “Air and Space”, I sometimes found his word play a little self-indulgent. In fact I would have half-expected his main character’s name to be some anagram for Steve Rushin. The incessant wordplay does not take away from the humor, warmth and realness of Rushin’s writing however. Rodney Poole manages in just 259 pages to become a fully realized character, with both good and bad characteristics. And for anyone who has meandered through the confusing phase between adolescence and full-blown adulthood, Rodney’s trials and tribulations, ups and downs become endearing. Those ups and downs include Rodney trying to find a job, since he is currently unemployed, seeing his best friend Keith about to move to Chicago and get married, and trying to court Mairead. Through those ups and downs, the constant in Rodney’s life is his local bar, Boyle’s, which he considers an important part of who he is and where he goes to celebrate the triumphs and commiserate the tragedies in his life. Of course, many of the constants in his life – including Boyle’s – go through a series of upheavals through the course of the book. Much of the change that results is good, no matter how much Rodney may initially rail against it. Rodney Poole is thirty-five, out of a job, and he has little if any ambition. He is a regular at Boyles, a local pub that allows him to join in trivial conversation, trivia contests, elaborate jokes, and a well-poured "pint". His best friend, Keith, is moving to Chicago and will soon be married. Rodney must now take a deeper look at his life. He is faced with the reality of being single, unemployed, middle-aged, and losing his drinking buddy. Rodney has been set up with a blind date. Mairead comes Rodney Poole is thirty-five, out of a job, and he has little if any ambition. He is a regular at Boyles, a local pub that allows him to join in trivial conversation, trivia contests, elaborate jokes, and a well-poured "pint". Rodney has been set up with a blind date. Mairead comes into his life and finds that they both have some common ground. They seem to like each other and enjoy the puns and pundits that are exchanged between them. Their budding relationship is jeopardized by several comic mishaps that evolve around his friendship with Keith and his bar stool at Boyles. The book is filled with trivia, plays on words, metaphors, palindrokmes, and conundrums. The best way to explain it is to give you a few samples of Rodney's wit and wisdom. The next two sentences are the same if you read them backwards. "Why do they sterilize the lethal-injection needles?" "How does a blind man know when to stop wiping?" "Re-hearsed - what does a casket get when it falls out of a hearse." These appear throughout the book as Rodney is forced to grow up. My favorite comment was "The bookstore was a kind of heaven. It was a place of eternal life." A very funny yet poignant book whose author is a great artist of wordplay. The main character, Rodney, finds comfort in a local bar that shelters him from the reality of being in his 30's without a job, spouse nor the slightest hint of a desirable future. Rodney is further challenged to reflect upon his station in life, as his drinking-buddy and best friend Keith is leaving town to be wed. Through very clever manipulation and juxtaposition of the English language, Rodney finds himself coming-of-ag A very funny yet poignant book whose author is a great artist of wordplay. Through very clever manipulation and juxtaposition of the English language, Rodney finds himself coming-of-age through simultaneous waxing and waning relationships. The wordplay, references, and similarities to *gulp* myself should be enough to push The Pint Man into 5-star territory, but so little actually happens that it less a novel than a collection of amusing thoughts. Still, it's one of the funnier novels you'll read and the meditations on Guinness, double entendres, palindromes, pub life, literature, friendship, and compatibility are sure to connect with anyone who's had a good pint over a crossword puzzle. Rushin is a fantastic writer and was the best sports columnist in the game for years, but his novel, while funny and well written, is underwhelming. If you take away the wordplay on every page--and some of it is very funny--you're left with a plot that's thinner than an American lager: boy likes girl, boy hopes to someday write a novel. Witty and likeable, but hardly memorable. I read this book when it first came out because the author was coming to our store for a signing and I was happy I did. Nicely written with characters you can relate to- guy like all of us trying to get through the day without screwing up too much. Supposedly Mr. Rushin is working on his second novel. I can't wait! This book was a look at the connectedness between people and their worlds and the role friends, jobs, alcohol, etc play I enjoyed the author's love of words and the wordplay throughout the book.at times it, the wordplay, seemed a bit overdone but not enough to spoil the book. I remembered Rushin from my youth spent reading Sports Illustrated. The book is an easy read filled with clever word-play. Almost as if he has been constructing this story around puns and nerd-jokes for his entire life. Worth the wait. This began as a slacker novel, but had a happy ending. This is the temptation too many American writers succumb to, both in books and other media. Having said that, this wasn't too bad. It was competently written, with real characters who do stupid things because they are human and frail. A delightful read that had me laughing out loud in too many places to mention. The only other person I've ever encountered who's made the observation that if you read too long on the toilet your foot will fall asleep. (P) Not very good. I didn't even feel good enough about this book to give it to somebody else after I was done with it. The author tried WAY too hard to be clever with the words. There were too many metaphors, etc. The "witty" banter was exhausting. A man I'd drink with any day. Read this one with beer. It just felt wrong when I tried not to. Clever and funny. If you're not familiar w the author's SI and WNBA connection, look him up on Wikipedia for some insight. This is a lip-smacking read for anyone who loves words. Rushin is a consummate language trickster, and in this novel manages to balance indulging his whims with advancing a sweet, nuanced story. Outstanding wordsmithing. Super fun light read. I'd read his next book for sure. Fun read but not crazy about the ending. After graduating from Bloomington Kennedy High School in 1984 and Marquette University in 1988, Rushin joined the staff of Sports Illustrated. Over the next 19 years, he filed stories from Greenland, India, Indonesia, the Arctic Circle and other farflung locales, as well as the usual nearflung locale to which sportswriters are routinely posted. His first novel, The Pint Man, was published by Doubl After graduating from Bloomington Kennedy High School in 1984 and Marquette University in 1988, Rushin joined the staff of Sports Illustrated. Over the next 19 years, he filed stories from Greenland, India, Indonesia, the Arctic Circle and other farflung locales, as well as the usual nearflung locale to which sportswriters are routinely posted. Rushin gave the commencement address at Marquette in 2007 and was awarded an honorary Doctor of Letters for “his unique gift of documenting the human condition through his writing.” In 2006, he was named the National Sportswriter of the Year by the National Sportswriters and Sportscasters Association. A four-time finalist for the National Magazine Award, Rushin has had his work anthologized in The Best American Sports Writing, The Best American Travel Writing and The Best American Magazine Writing collections. His essays have appeared in Time magazine and The New York Times. He writes a weekly column for SI.com and is a What TK to Golf Digest. His first book, Road Swing, published in 1998, was named one of the “Best Books of the Year” by Publishers Weekly and one of the “Top 100 Sports Books of All Time” by Sports Illustrated. Rushin’s next book, a work of nonfiction called The Baseball Grenade, will be published by Little, Brown in 2013.